Friday night I cooked dinner again, beef steaks from the local butcher with Bernaise sauce and a tomato salad. We opened a bottle of Cambria 2004 Pinot Noir which was worth remembering. Yummy! We were pretty lazy on Saturday. I did some design work on an electronics project (a custom USB device for robotics) while Eileen cleaned her office and worked on her next book. Later in the afternoon I caught an episode of the new BattleStar Galactica. It was the third episode of the second season, and excellent as expected. I’m still not exactly sure where the religious storyline is going but I’m willing to hang in there to find out. I also realized I missed episode two. I was quite unpleased I had missed that episode. I was willing to buy the episode, I figured it was worth a few bucks for the instant gratification. The iTunes Store does carry BSG episodes, but its not for sale in Canada. Stupid. So I set off to find a viable download online. It took all night to get the episode using a BitTorrent feed (that link takes you to the software, not to the torrent download, but whatever). I eventually watched the missing episode and it was really good. Better than I expected, and I had high expectations. Also let it be known that its time to bring television show downloads to Canada. Are you listening, Apple? Meanwhile Eileen went out to dinner and a film with our good friend Allison while I stayed home to watch the Canucks. They went to see Memoirs of a Geisha and raved about it. I want to go too so she’ll have to sit through it again. Apparently this won’t be a hardship at all. Eileen got home in time to see the end of the hockey game. Enough said about that ugliness! In the afternoon we attended the first birthday party for Tobias’ and Sharon’s daughter Isabel. They served monkey cake (not made from real monkeys) and we had lots of fun catching up with them and their friend Pidge. We met lots of other nice folks too. Eileen and I realized it’s been a long time since we’ve seen either Sharon or Isabel and she is getting big (Isabel, not Sharon). She already tears around the house like she owns the place, and just about ready to start walking. Just great! Sunday evening was spent watching The Constant Gardener. Ralph Fiennes and Rachel Weisz are wonderful actors that bring true passion to very passionate roles. Its a deep story but the pacing is off, at least in the first two thirds of the film. Still worth viewing though, as the last third is simply amazing. The background scenery is simultaneously stunning, frightening, intriguing and inspiring. Eileen rented the DVD this time and I’m really glad she did. I probably would not have rented it, as you might remember I was always going to prefer using the video on demand service. I found the DVD extras really informative especially the section that described how and where it was filmed – they filmed in Kenya, often in places that were not “dressed” as sets. They filmed real people in their real villages as part of the backdrop to the actors in the foreground. Stunning, unique and welcome. And then it was Monday, and back to work. Tonight I was flipping around channels on the television when I found this Nova program about building a trebuchet (its episode #101, Medieval Siege). 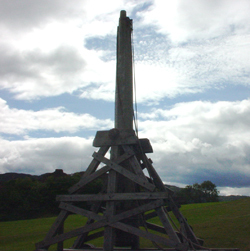 As part of the introduction it was noted they were building the full-scale trebuchet at Castle Urquhart in Scotland. Wait a minute, I said to myself. I’ve been to that castle. And I recall seeing a trebuchet in Scotland. I went back through our travel photos from our trip to Scotland in the summer of 2004 and sure enough, its the same one! After they built the trebuchet for the Nova program it remained on display at the castle. It’s believed the castle was under siege by one or more trebuchets at least once in its long history. I wish I had a better photo. It was “typical Scottish weather” – some rain, some cloud, some sun, some wind, etc. The photo is too dark and too flat. Really have to pay more attention when shooting photos outdoors, as this happens to me more often than I’d care to admit. And I must figure out how to get text wrapping around my pictures. It looks terrible with all that whitespace around it. You can see some of the better photos from that trip here. Enjoy! Why do I do this to myself? Today I was working at home and decided to tune into the Canucks vs. Blue Jackets game. I wasn’t watching the clock carefully (hey, I was working! really!) so I turned on the television late. That probably saved me from developing ulcers. Keeping with tradition, the Canucks gave up two goals quickly; the first occurred at 1:14 and the second went past Auld at 4:13. I joined the game late in the first period. Not long after I tuned in the Canucks scored so I felt there was real hope. There was no hope. Those guys lost again (6 – 5). Oh the pain. Last Saturday the Vancouver Canucks played the Montreal Canadians at home. Montreal has been struggling a bit but even so it should have been well-matched game. Nope. It was a blow out: the Canucks scored six goals in the first period, forcing Montreal into the period break with a pitiful eight shots and no goals. Final score was 6 – 2; the Canucks played and won with confidence. That was then, this is now. Tonight the Canucks were in St. Louise to play the Blues. The Blues are terrible this year, with just 10 wins in 46 games played. Compare that to the Canucks (28 wins in 48 games), Detroit (32 wins in 47 games) or Ottawa (32 wins in 46 games). They are the worst team in the league. They’ve lost their last nine games. Last time they won? They played the Vancouver Canucks on January 2nd. The Blues won that game 4 – 1. The game tonight was hard for a Canuck fan, as they lost 4 – 0. The Canucks looked sloppy, took way too many penalties in the first two periods and played like someone tied bricks to their skates. Sigh. My theory is that they purposely adjust their game to play just below the skill level of their low-ranking opponents. Maybe they feel sorry for the other team. I dunno know why they do it, it just looks like they do it. Let’s hope they can rebound, the next game is tomorrow night against the Columbus Blue Jackets who have 17 wins in 49 games, making them the third worst team in the league. I’m not sure I can bear to watch. Comments Off on Those Darn Canucks! Eileen and I have seen three movies in the last week or so, and being a movie buff I quickly developed a few opinions about where these movies fit in my very own personal categorization scheme. Peter Jackson spent way too much time on 1, 2, 3, 5, and 6. He spent the right amount of time on 7. He also spent a lot of time with the “gross out the audience” scenes with giant bugs eating the extra cast members, and way too much time watching Kong vs. Dinosaurs fight scenes showing off the wonderful effects he could buy. Lots of extraneous backstory was inserted into 1 & 2. The first half the movie is wrapped up in getting the characters to the island, the second half primarily deals with meeting natives and chasing the ape, the last fifteen minutes deals with NYC and the falling ape, and frankly its boring, predictable and downright lazy. 6 out of 10 at best. Today we saw two movies back-to-back. The first was Casanova. My expectations were low based on the advertising, but we got a positive recommendation from friends so we went anyways. It was very funny and the comparisons to Shakespeare in Love are quite appropriate at multiple levels. Heath Ledger does a reasonably good job of acting but Oliver Platt and Jeremey Irons give way better performances. Its a clever, witty story that moves along at the right pace. 8 out of 10 minimum, recommended by both Eileen and myself. Next up was Capote. This is the story of Truman Capote and the writing of his prize winning novel In Cold Blood. It was a really fantastic movie with excellent acting by the entire cast. Eileen knew way more about the story than I did but we both found it very enjoyable. It’s a powerful story and its quite an interesting and entertaining story. If you don’t know anything about Capote then please see this movie as you’ll be introduced to one of the most significant American writers of all time. Easy to see why this movie is getting a lot of buzz. 10 out of 10.